American painter Norman Rockwell tried to enlist in the Navy during World War 1 but was rejected for being 8 pounds underweight. He successfully enlisted the next day after spending the night gorging himself on bananas, liquids, and doughnuts. 2. The "Ecce Homo" painting which was turned into the "Potato Jesus" meme after a failed restoration has increased tourism in that area and the funds go towards the church-owned nursing home and the "art restorer's" son who suffers from cerebral palsy. 3. The mysterious baroque painter Johannes Gumpp is known to have painted only one self-portrait which also happens to be a triple self-portrait in which he appears from behind painting his own face reflected in a mirror. 4. The man standing behind George Washington and holding the American flag in the famous painting "Washington Crossing the Delaware" is an 18-year-old officer and future president James Monroe. 5. Raphael was the one who was first chosen to paint the Sistine Chapel. He was jealous of Michelangelo's fame, so he convinced the Pope to hire Michelangelo instead, hoping to prove that Michelangelo was just a sculptor and could not paint that well. Bob Ross never received any money for his show “The Joy of Painting.” His company, Bob Ross Inc., sold art supplies, how-to videos, and he gave art lessons. 7. Salvador Dali made a painting for the prisoners at Rikers Island in NYC that hung in the prisoner dining room for 15 years, when it was moved to the prison lobby for 'safekeeping'. In 2003, three prison guards and a warden stole the painting. 8. The models for the famous painting 'American Gothic' were not husband and wife, or father and daughter. The pairs were the painter's sister and his dentist. 9. Le Bateau ("The Boat") by Henri Matisse, caused a minor stir when the Museum of Modern Art, New York, which housed it, hung the work upside-down for 47 days in 1961 until Genevieve Habert, a stockbroker, noticed the mistake and notified a guard. 10. A Polish painter named Rafał Bujnowski painted a photo-realistic self-portrait in black and white, had it photographed and enclosed the picture as his official photo in the U.S.A. visa application form. Eventually, the artist received a passport with a replica of his own painting. A Georgian painter named Niko Pirosmani fell in love with a French dancer so hard, he sold everything he owned and bestowed her with thousands of roses. His romantic gesture inspired the popular Russian song A Million Scarlet Roses (1984). 12. The Unfinished Portrait was a forever incomplete painting of Franklin D. Roosevelt. It captured his last waking moments before he collapsed from a sudden stroke. He never regained consciousness and died later that day. 13. When the Spanish painter Francisco Goya was a deaf man in his 70s, he painted 14 pieces directly onto the walls of his home, all unnamed, and they include some of his most important work. 14. 'The Starry Night' depicts Vincent Van Gogh's view from the Saint-Paul-de-Mausole asylum. 15. Leonardo Da Vinci etched his initials into the Mona Lisa's right eye. Due to lack of funds, Pablo Picasso’s The Old Guitarist was painted over another painting of a woman in a field nursing a child next to a sheep and a bull. 17. Garden of Earthly Delights by Hieronymus Bosch can be closed, and there is another painting on the exterior. 18. The woman depicted in Jan van Eyck's famous 'The Arnolfini Painting' isn't pregnant. She is wearing contemporary (1434) fashion befitting the wife of a wealthy cloth merchant. 19. Salvador Dalì's 'The Persistence of Memory' is actually about Albert Einstein's Special Theory of Relativity. 20. The Last Supper by Leonardo da Vinci was used for target practice by Napoleon's soldiers stationed in Milan, with Jesus’s face as the bullseye. The soldiers hit the mark at least a couple of times, but the mural has since been restored. A French painter named Édouard Manet challenged a critic to a sword duel after taking offense to a single sentence about his works. Seconded by writer Emile Zola, the duel ended after one blow when the critic sustained a minor wound. That was enough for Manet to restore his honor and the riff was mended. 22. The 1436 painting by Jan Van Eyck "Virgin and Child with Canon van der Paele" is so detailed it includes a self-portrait of the painter in the reflection of the harness of one of the characters. 23. An Italian painter named Caravaggio often swaggered about with a sword at his side, ever ready to engage in an argument and was arrested repeatedly throughout his life for, among other things, slashing the cloak of an adversary, throwing a plate of artichokes at a waiter, scarring a guard, and abusing the police. 24. When the famous French artist Paul Gauguin died, a native Polynesian tried to revive him, by chewing his head. 25. 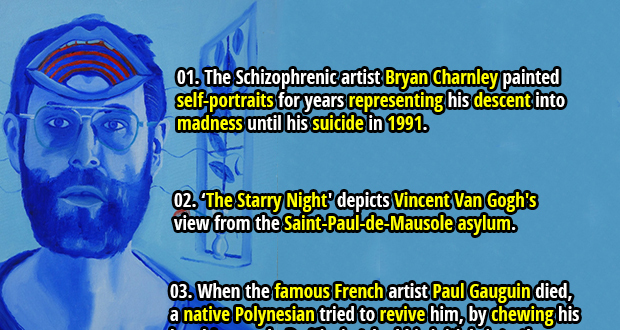 The Schizophrenic artist Bryan Charnley painted self-portraits for years representing his descent into madness until his suicide in 1991.